Classes offered by Learning Skills teachers are one component of Grier’s multi-faceted approach to ensuring individual academic success. When enrolled in Learning Skills classes, students receive individualized instruction in small group settings or even one-on-one. The students that benefit from Learning Skills are varied in their backgrounds, strengths, and challenges. From the youngest Grier students to those preparing for college and beyond, Learning Skills teachers are there each step of the way. Grier’s Learning Skills Department Head, Mrs. Jeanie Gerber explains, “In Learning Skills, we meet each student where she is academically and work with her to improve the skills she will need to succeed at Grier and beyond. We tutor the students in their academic subjects and help them improve their note-taking and test-taking skills as well as their executive functioning skills.” To understand the scope of how Learning Skills accomplishes this, meet three unique Grier girls and observe the variations in support they receive. Alexa is an eighth grade honors student from New York City in her first year at Grier. She is in Mrs. Greta McCracken’s second period Learning Skills class. Today, Mrs. McCracken is checking to make sure Alexa did her homework. “Tell me, honestly, did you read your chapter last night?” her teacher asks. With an emphatic nod, Alexa confirms that she did, in fact. In addition to verifying homework completion, Mrs. McCracken reviews upcoming assignment due dates with Alexa who is learning to use a daily planner. In this way, Alexa is developing foundational organization skills that will help her throughout her academic career. As they complete their routine, Alexa acknowledges that she was not able to complete her Algebra I assignment the previous night. Mrs. McCracken helps Alexa identify what prevented her from completing the work and offers some ideas and resources Alexa can use the next time she gets stuck on a homework problem. Mrs. McCracken is helping Alexa develop coping strategies so that when Alexa meets a challenge, she is prepared to face it. As Alexa presents the tricky problems to her, Mrs. McCracken reminds her of the rules of solving for variables with negative numbers by singing a memorable song. This mnemonic device is one among many that can help students retain information. Alexa can remember this song as she completes her problem set today and again when she takes the unit test. Although it is only her first year here, Alexa and Mrs. McCracken have already developed a great working relationship. 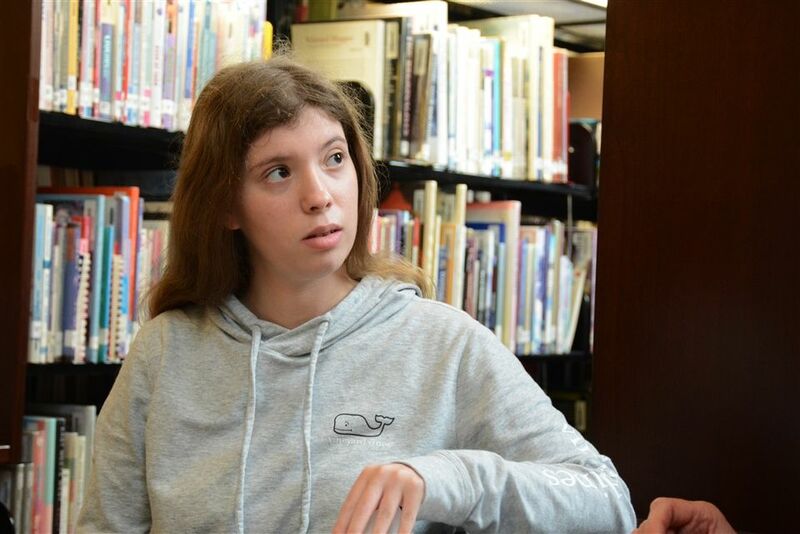 Alexa’s receptiveness to Mrs. McCracken’s assistance and her determination to work through the challenges of her coursework have helped her succeed and allowed her academic self-confidence to grow. Cassidy is only one grade ahead of Alexa, and this is also her first year at Grier, but she has an entirely different academic plan. A ninth grade student from Raleigh, North Carolina, Cassidy is a competitive rider and was drawn to Grier largely because of its excellent Riding Program. The knowledge that at Grier, Cassidy would receive the necessary support to succeed academically while also being able to pursue her passion for competitive riding was critically important to her and her parents. Honing time management skills is an essential part of Cassidy’s individual academic plan. Because she competes in Hunt/Seat Equitation, traveling for horse shows takes her away from Grier about one school day each week, on average. Prior to departing for a competition, Cassidy’s teachers submit lessons and assignments to Mrs. Davis. In some cases, Mrs. Davis provides instruction to Cassidy on the course material she will be missing. Using skills learned with Mrs. Davis, Cassidy prioritizes tasks and begins working ahead on upcoming assignments so that she is exactly on track when she returns to Grier for classes. Currently, Cassidy attends two class periods of Learning Skills to give her ample time to understand course material and complete assignments. Soon, Cassidy will be preparing for a long leave from Grier when she attends the HITS Ocala competition with her horse, Cappy. Mrs. Davis will serve as liaison between Cassidy and her teachers, making sure Cassidy is on pace with the rest of her classmates. Cassidy is thriving at Grier and adapting very well to the independence of boarding school. Mrs. Davis notes, with a proud smile and a nod toward her student, that Cassidy is able to succeed with this plan because she puts forth the time and effort to make it work. New Jersey native, senior Kayla, is in her third year at Grier. Kayla’s family identified Learning Skills as a key to Kayla’s academic success during their admissions process, and Kayla has been working with Mrs. Shelly Davis ever since. A large focus of Kayla’s Learning Skills plan was developing test-taking skills. Mrs. Davis helped Kayla learn study skills using methods that included flashcards, Quizlet, color-coding, and mnemonic devices. With the scaffolding of Learning Skills, not only have Kayla’s test scores improved, but she reports feeling more confident and able to prepare effectively for tests. While Kayla was generally well-organized, she needed the support of Learning Skills to help her learn to balance the academic workload and work more efficiently, resulting in less stress. Now that she is headed to college at Lynn University next fall, Mrs. Davis is essentially “weaning” Kayla from the supportive infrastructure of Learning Skills. Kayla has transitioned from a sophomore in two periods of Learning Skills, down to one period in her junior year, and soon, Kayla will work with Mrs. Davis only a few days each week. Kayla is well-prepared for college academics with the tools and strategies she has developed in the Learning Skills program. She can take these tools cultivated at Grier with her to college, where she plans to study Communications and Video Production. Grier’s Learning Skills Department tailors academic plans to meet the individual needs of our students. Ultimately, the goal of the learning skills teachers and their students is to cultivate learners who will be successful both in Grier’s college preparatory curriculum and at university. Students like Alexa, Cassidy, and Kayla enroll in Learning Skills for a variety reasons, but they all share the drive to succeed and the support of their dedicated teachers. Learn more about Learning Skills at Grier. Mrs. McCracken and Alexa working on her Algebra I homework. Alexa and Mrs. McCracken reviewing due dates and getting organized. Cassidy is able to participate in competitive horseback riding often with the support of Mrs. Davis. Cassidy has two periods of Learning Skills class with Mrs. Davis. Kayla is a senior and will be attending college next fall. Kayla and Mrs. Davis strategizing how to study for an upcoming Art History Honors test.